Even a life on the untamed plains of Africa can’t prepare Wilhelmina for the wilds of an English boarding school in this “gripping, magical, and heartwarming tale of resilience, friendship, and hope” (Publishers Weekly, starred review). Wilhelmina Silver’s world is golden. Living half-wild on an African farm with her horse, her monkey, and her best friend, every day is beautiful. But when her home is sold and Will is sent away to boarding school in England, the world becomes impossibly difficult. Lions and hyenas are nothing compared to packs of vicious schoolgirls. Where can a girl run to in London? And will she have the courage to survive? From the author of Rooftoppers, which Booklist called “a glorious adventure,” comes an utterly beautiful story that’s “a treasure of a book” (VOYA). Katherine Rundell is the author of Rooftoppers, Cartwheeling in Thunderstorms (a Boston Globe–Horn Book Award winner), The Wolf Wilder, and The Explorer. She grew up in Zimbabwe, Brussels, and London, and is currently a Fellow of All Souls College, Oxford. She begins each day with a cartwheel and believes that reading is almost exactly the same as cartwheeling: it turns the world upside down and leaves you breathless. In her spare time, she enjoys walking on tightropes and trespassing on the rooftops of Oxford colleges. “Cartwheeling in Thunderstorms is the work of a writer with an utterly distinctive voice and a wild imagination. I admire her novels very much, and I hope they find the success they deserve. I’m certainly looking forward to her next." *"With debut novel Rooftoppers (2013), Rundell showed her capacity to write an entertaining story featuring a courageous female protagonist; this second novel surpasses by virtue of its striking, soaring prose." *"A gripping, magical, and heartwarming tale of resilience, friendship, and hope." *"Rundell’s language soars in this portrait of a fierce and largehearted girl." 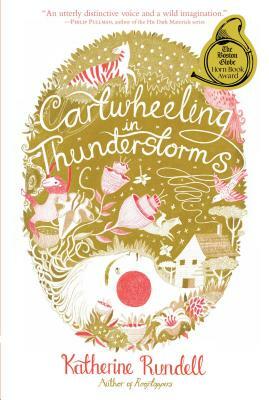 "Cartwheeling in Thunderstorms is a treasure of a book." "Instead of making Zimbabwe some mysterious “other” place, she imbues it with color, love and vibrancy...Cartwheeling in Thunderstorms offers readers a sympathetic and enticing portrait of a part of the world they might not have heard of before reading this book, but will certainly be intrigued by ever after." "Katherine Rundell once again demonstrates her ability to weave a story with a strong, determined female character...This one's for readers who appreciate the classic elements of storytelling with a twist." "Rundell’s vivid and compelling prose brings both worlds to life on a visceral level and propels her characters forward. Readers will be engaged by Will’s voice (and her colorful linguistic twists), ache for her through her sorrow and loss, and celebrate her newly sparked confidence and resolve. Warning: there will be cartwheels!" "Rundell writes with a beautiful voice...both gripping and profound." "Rundell’s finely drawn etchings of the people in Will’s sphere and rich descriptions of African colonial farm life sprawl across the page in sensual largesse."